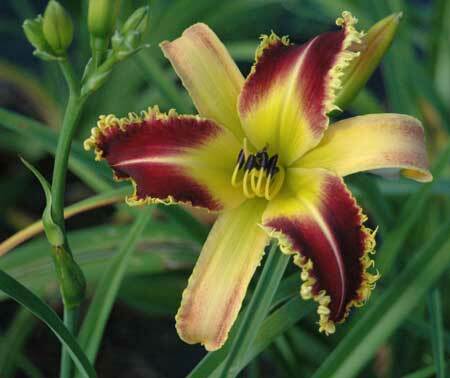 Jamie texted me this morning and scolded me for mentioning his name on the daylily blog for bidding on seeds on the lily auction and he was wondering what all the noise was about with Larry Grace claiming he may have the real Dentist teeth daylily. Without hesitation I picked up the phone and called Jamie and mended fences. It was easy. I explained to Jamie it was actually a compliment if someone outbids him. I said, “After all since you are one of the World’s foremost authorities on teeth hybridization, many people are watching and listening to you.” I said to Jamie “you are the E.F. Hutton of daylilies!” Jamie then laughed and said “I suppose.” The second part of the story, Jamie wondering about Larry Grace and the Dentist Award. Jamie said “how could this be?” “After all I have a daylily named the DENTIST.” I said, “yes, but…..”, and then Jamie understood. But was he happy? Time will tell but as we talked he was already thinking outloud. Image is a seedling from this years introduction LOVE ALL SERVE ALL. This entry was posted in Club Visits, People Pictures and tagged daylily, daylily blog, Dentist, Jamie Gossard, Larry Grace, love all serve all, mike holmes. Bookmark the permalink. That Jamie Gossard is just a big crybaby!! !